Unfortunately I don't remember where I found this picture or who the artist is. I am pretty sure it comes from DigitalArt.org but I can't say for certain. I think its a great piece and an inspiring looking place for adventures in game. I just imagine the PC's entering a lost kingdom high in the mountains full of dark secrets and powerful magic. It also reminds me of Hyberborea from Conan the Frost Giants Daughter, and anything that reminds me of Conan is awesome. In my years of gaming I've dealt with rules lawyers, power gamers, mix/maxers and almost every RPG stereotype. But in my opinion the worst, most irritating and contentious player is the whiner. 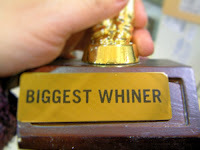 A whiner is never satisfied. When their PC is is in the spotlight, they complain they that the spotlights too bright, and when they're not in the spotlight they complain that they can't see. In they're minds they are always running at a deficit. Somehow, someone is always getting the better of them and making their little lives oh so difficult, and they want you and everyone else to know it. Its unfortunate that some gaming groups are plagued with the whiner, and in some cases due to friendship or politics have to keep that person in the group. I have had to deal with it twice in my gaming history and I've developed some rules to help the situation.